The directions are stated on the bottle. To get this particular color here is how we did it. 1. Wash hair in the shower, as normal. 2. I squeezed out as much water out of my hair as I could with my hands. There are many options here. The more dry your hair the more color it will absorb. Because my hair was pretty light to start, I went with a good ol' hand squeeze dry technique. 3. I brought a mirror and a claw clip in the shower with me. I separated my hair in sections and sprayed. Focusing on the ends but also getting close to the root. 4. I waiting about 3 minutes and then rinsed out. 5. Condition and BAMB. I am done. It is all the rage and we needed to try it. 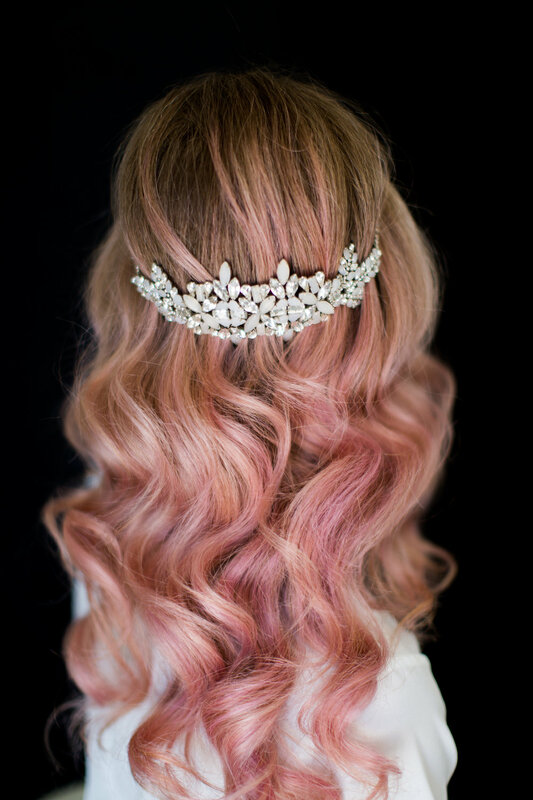 Kristin Ess Rosegold Hair Tint is all you can dream and more. The directions were simple: wash hair, spray hair, wash out, condition. We were loving the results so we went to our girls to take some pics and accessorize with Untamed Petals pieces. Natalie gave me curls and volume while Asia snapped a few shots.